Nearly six years ago, at Keleti pu, Budapest’s largest train station, a group of people got on an early morning train headed for Vienna so that my South Korean partner and I could get married in a small town in Burgenland. We had more or less randomly chosen the location because the wedding halls in Vienna had been all booked up. And as I was still living and studying in Budapest during those times, the venue to choose had to be close enough for us to take the train back and forth across the Hungarian border in one day. So Burgenland it would be. But we were happy enough and very relieved despite such hiccups. It had been an incredibly long and tedious process that had taken us through countless Austrian offices in numerous places to get my husband’s documents translated, certified and stamped, to get him registered in the country for the occasion, and to finally receive the actual permit to get married. One office person pointed out a missing file to me by telling me that she knew “very well how to handle cases that involved those kinds of people,” pointing her finger at my future spouse. Another bureaucrat I tried to argue with told me that he had plenty of experience registering the foreign prostitutes working in a nearby brothel, so clearly he was an authority on how to get this matter solved. Another one threatened us with the “aliens’ police” before we had even had time to explain the basics. Somehow, however, all the bureaucratic hurdles were taken out of the way and we got the necessary papers so that we could get hitched. Now, admittedly, we probably should have been suspect to the people handling our files; two people in our mid-20s with no money to speak of who were so clearly not motivated by their deep belief in the sacred institution of marriage and their urgent desire to enter into holy matrimony. It was just a matter of fact that if we wanted to stay together and live in Europe, marriage was our best option, given the very short list of possibilities that is open to non-EU citizens who would like to come and live in our part of the world these days. What an innocent time that was still, in retrospect. Yesterday, they found an abandoned truck filled with the corpses of more than 70 refugees close by the highway exit of that same sleepy town. People who slowly suffocated and had their lives extinguished simply because they wanted to be in safety, and reach a country where their chances of getting pepper-sprayed, beaten up by the police, or of being robbed by organized criminals might prove to be a bit smaller than in the countries they had already passed through on their long journey. 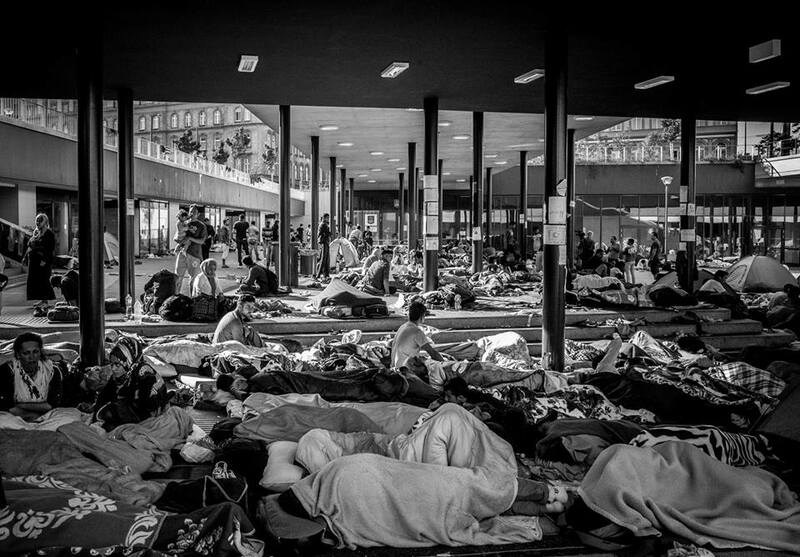 It seems that the refugees entered the cooling truck that would cost them their lives in Budapest, possibly even near Keleti train station – the transportation hub in central Budapest that over recent days has been turned into a makeshift transit center where hundreds of refugees camp out in the underpass adjacent to the actual train station. The truck that would take these ill-fated people in, originally owned by a Slovak company, is registered under the name of a Romanian citizen, who got the license plate for his vehicle in the Hungarian town of Kecskemét. Austrian police assume that the refugees died a few days ago already, most likely before they would even pass the border into Austria. The driver(s), once they must have realized that they had just killed more than 70 women and men, parked the truck and ran, abandoning the vehicle and its cargo by the side of the highway sometime during Wednesday this week. These people’s deaths – as much as they may seem to be the result of a tragic coincidence – are in fact the kind of occurrence that was bound to happen in the new hot-zone between Hungary and Austria, two countries whose governments have recently done nearly everything they could to make the safe arrival or passage of refugees through their terrain as difficult as possible. The disgraceful treatment that refugees are receiving by the Hungarian government has triggered much bad press across Europe, with all its barbed-wire fences, the tear-gassing of desperate people who find themselves stuck in a no-man’s-land between Serbia and Hungary, and the occasional transportation of refugees in closed cattle train cars (and yes, not only residents of Europe would have a sense of the circumstances under which large numbers of people were last time around herded into such trains in this particular region). However, Austria has much to be deeply ashamed of, too, and one could argue that you cannot possibly understand the situation in Hungary without looking at what its neighbor is up to these days as well. The town of Traiskirchen, a short distance away from Vienna, offers scenes to the visitor that could be taken directly out of the screenplay of Children of Men: stories of women giving birth without medical assistance are frequently heard, traumatized people are known to pace around without receiving proper care for weeks on end, 1,700 unaccompanied children and teenagers at the camp are left without care, and at times 2,000 refugees were made to sleep outside without shelter. To give you a sense of how much Hungary and Austria are caught up in this together, let me quickly track back in time a bit to the early summer, when on May 31st, the Freedom Party (Austria’s far-right party) made great gains in two regional elections, a success they could credit solely to their anti-asylum campaign. The Austrian ruling conservative party, in a state of panic over these results, has been doing everything they could ever since to show that they, too, can play the anti-refugee card. Amidst all of these attempts of screaming as loudly as the far right that “the boat is full,” in early June, the Austrian government announced that they would stop processing new asylum requests, and would focus on getting rid of the “Dublin cases” instead (that is, they essentially attempted to organize mass deportations of refugees to the first country they entered within the EU, which, in the case of those who end up in Austria, is usually Hungary). The Hungarian government, the very next day, replied to say that they would not be taking those Dublin cases back, prompting a lot of accusations from near and far that they were about to violate key EU regulations. This declaration by the Hungarians was in turn followed by a statement in Austria that if the neighbors to the East would not quickly back off, Austria would be reinstating its border control. Hungary and Austria are two cases that are symptomatic for the larger processes that are choking Europe today. We have seen it unfold during the recent Greek crisis, when one truth became painfully clear: in the European Union of 2015, when push comes to shove, we are to be all on our own again, every nation by themselves, waving our own little flags, while we are simultaneously still trapped in this European cage of legislation that was built around us, and that increasingly serves as a tool for the more powerful states to push the weaker ones around. The EU fortress, at the same time, has proven itself to be a heavily fortified yet ideologically empty construct, and the far-right hordes are cheerfully taking up the opportunity to fill the charmless vacuum that the bureaucrats of Brussels have created around themselves. This kind of deadly talk will surely keep us occupied over the months to come, and it will cost many, many more lives, while we run the risk of quietly getting rid of the last few good things that our little continent may still stand for. Amongst them this belief that perhaps there can be something that unites us all – a common, a joint destiny even; humans, standing side by side. We really have to think hard these days, those of us who consider ourselves to be of the Left: are we doing enough yet to convince our politicians, the cops and border guards, and all those ordinary folks out there that the lives of these people do count? Are we involved enough yet? Are we making this our very own problem? We share a bit of the responsibility for their deaths, and that of thousands of others like them who have perished over the last few months. Killed in their desperate attempt to find a place where they can live decent lives, without the threat of jail time, torture, murder or starvation constantly lingering over them and their families. Elisabeth Schober is a post-doctoral fellow at the University of Oslo’s Department of Social Anthropology. During her PhD studies at Central European University (Hungary), she spent 21 months in South Korea, exploring the impact of the long-term presence of the U.S. military on entertainment areas in and near the capital Seoul. Currently, she is looking into labor relations at a large Korean shipyard in Subic Bay (the Philippines), a community that was previously dominated by a large U.S. Navy facility in its midst.